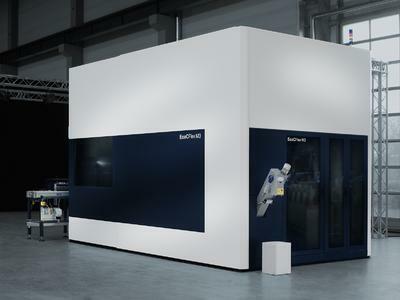 What strikes the observer first about the new EcoCFlex 3 is Dürr Ecoclean's proprietary scara manipulator replacing the standard 6-axis jointed-arm robot, as well as the machine's exceptional design. A view under the hood reveals further details contributing to its superior process reliability, quality, energy efficiency and availability rates in pre-cleaning and final cleaning of powertrain components. In the pre- and final cleaning of powertrain parts such as cylinder heads, engine blocks and crankcases, robot cells not just improve flexibility. 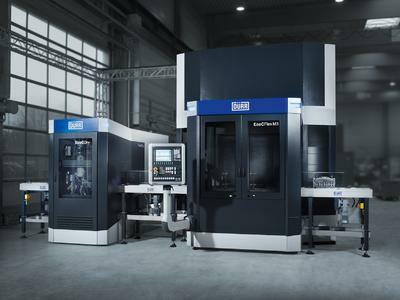 They also allow parts to be cleaned in short cycles, which makes them an indispensable asset in advanced engine and transmission manufacturing lines. With over 400 robot systems built, Dürr Ecoclean of Monschau possesses plenty of experience and has gained extensive customer feedback on optimization potentials. Both went into the development of the new EcoCFlex 3 which is available in two sizes as a 3M and 3L version. An essential part of equipment is the robot, which is normally a modified standard type. However, despite extensive adaptations, these units cannot always cope with the harsh conditions encountered in cleaning applications, e.g., moisture, high temperatures and use of chemicals. As a result, unscheduled breakdowns and costly repairs occur time and again. The EcoCFlex 3 does away with this problem. A scara manipulator developed by Dürr Ecoclean replaces the standard commercial 6-axis jointed-arm robot in this cleaning machine. Purpose-designed for use in a robot cell, this handling system is made entirely of high-strength aluminium and stainless steel. It needs neither paintwork nor a protective suit. Thanks to its IP69 protection rating, Dürr Ecoclean's scara manipulator is resistant to high-pressure water jets and to immersion, in addition to withstanding booth temperatures up to 65°C. The cleaning chemicals employed may range from pH 6 to pH 10 and need no external robot manufacturer's approval to be used or replaced. Furthermore, the EcoCFlex 3 overcomes issues associated with the use of different control systems. One joint CNC control unit for the scara manipulator and the cleaning machine replaces the previously required PLC and robot controller. This greatly simplifies and accelerates the programming, operation, maintenance and start-up after a change in parts to be treated. The sensor system for calibrating the scara manipulator is integrated already. The EcoCFlex 3 also sets new standards in terms of its equipment level and features. A water knife directs the water jet in a focused pattern onto the areas to be cleaned, unlike a conventional round nozzle. Moreover, the machine is fitted with a so-called hybrid nozzle having a variable mixing chamber. Thanks to this configuration, both high-pressure and low-pressure treatments – in addition to injection flood washing – can be flexibly performed in one cleaning station. All cleaning operations, including high-pressure deburring, take place below the bath surface, which helps to reduce the noise level to just 72 dB(A). The idling times needed for part handling in the work chamber are likewise markedly reduced with this new process technology. Thus, in conjunction with the modular vestibule design, it is possible to obtain 'on-spec' cleaning results in cycles starting from as little as 30 seconds. When it comes to resource efficiency and sustainability, the EcoCFlex 3 excels by an energy consumption of only 30 kWh. Demand can be easily supervised via the optional energy monitoring system. 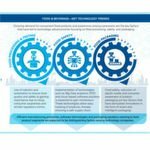 The latter indicates current consumption values – e.g., for electricity, compressed air, cooling water and heating – in real time and stores them in memory. The energy consumption can be logged per cycle, per shift or per hour. User-specific tariff rates of the individual energy media can be easily entered via an input screen. This allows accurate estimates to be made of the cleaning costs per part. 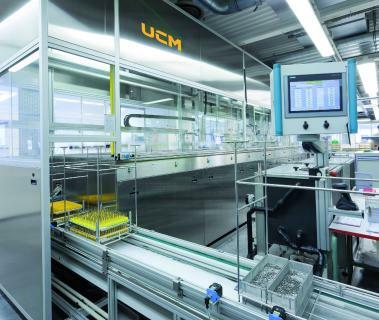 With its reduced footprint of only 32 m², the EcoCFlex again sets a new standard for robot cells. This low floorspace requirement also reflects the fact that no space is 'wasted' for drying with compressed air. 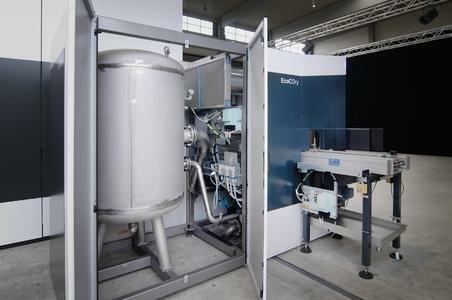 Instead, drying is performed in the EcoCDry system, a newly developed high-efficiency vacuum drier which uses no upstream compressed air blow-off stage. As a result, the part will cool down only slightly before the vacuum drying step. Thanks not least to this low temperature loss and the complete elimination of compressed air, the EcoCDry needs approx. 65 percent less energy than a vacuum dryer with upstream air blowing (based on a calculated compressed air consumption of 2 Nm³ per part). The vacuum is generated in the pressure vessel during non-productive times. 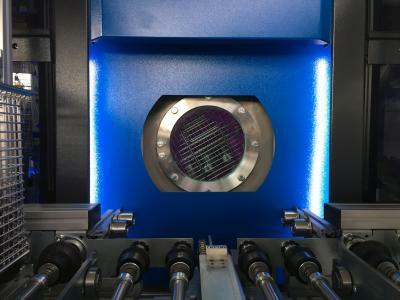 This results in about 50% shorter cycle times compared to a system with compressed air blowing and vacuum drying. 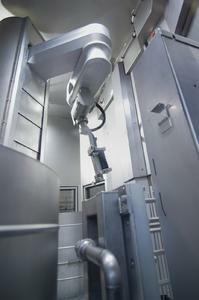 The new EcoCDry vacuum drier can also be retrofitted to existing robot cells. As a leading supplier, Dürr Ecoclean supplies automotive manufacturers and suppliers, as well as the broad industrial market, with the latest cleaning technology and systems for surface activation and treatment. 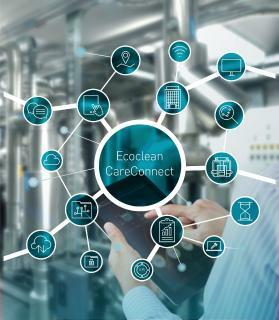 With individually tailored technology from Dürr Ecoclean, customers can exploit potential savings for example in unit costs, energy consumption and process time. Dürr Ecoclean is part of the Dürr Group worldwide and has over ten sites in eight countries with approximately 800 employees.